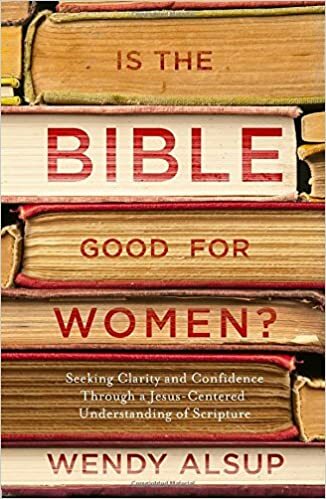 This excerpt is adapted from Is the Bible Good for Women? Seeking Clarity and Confidence through a Jesus-centered Understanding of Scripture. It’s available now at Amazon. If you have read it, please consider leaving a review at Amazon, CBD, or Goodreads. Most considering faith in Jesus want to know if God is good. Even those of us who have long since come to faith wrestle at times to believe our God and His Word are good when our circumstances, in contrast, seem so bad. God promises to work all things together for our good (Romans 8:28). The magic question then is what does God mean when He uses that word, good? Consider the interaction in the Gospels between Jesus and the rich young ruler, a seeker wrestling with His claims. This exchange gives us insight into God’s version of good. One might think Jesus would have eased the tone of His message to draw to faith this young man who was clearly seeking truth—that Jesus would have lured him in with some promise of earthly goodness. But He took a different tactic, painting in stark terms what following Him would mean for this man. Jesus didn’t give an easy answer to this young man, but He did give one that was consistent with His message throughout the New Testament: if you want to find your life, you must first lose it. He spoke to this man of loss, and it seemed a weight this man could not endure. He left Jesus sorrowful; God’s call was too heavy to bear. Yet Jesus always called His disciples through loss to a reward. To this young man, Jesus promised treasure in heaven. Jesus’s call was very much a good call with a good outcome, but this young man was too bound to his earthly possessions to perceive it. God’s good is a counterintuitive good from our earthly perspective, but it is the best kind of good. When I first read this interaction between Jesus and the young ruler, I was struck by the juxtaposition of Jesus’s love for this man and the message He spoke to him. But Jesus did not tell him an unloving thing. Jesus told him a true thing, and we fool ourselves regarding the nature of genuine love when we believe that it would be better served with a lie. A lying love is a shortsighted love. When I read this verse, I envision Jesus looking through a door into a room filled with the worst kind of pain and shame: what He experienced on the cross. Yet through a door on the other side of the room, He can see through the pain and shame of the cross to the purest kind of joy and goodness. He walked through that room of pain and shame, enduring the worst evil, and then through the door on the other side, where He now sits in peace and joy at the right hand of His Father. And according to Hebrews 12:2, we are to look to Him. He is our inspiration for and example of something God calls us to here on earth. No, God’s version of good sets such a view of the fulfillment of our potential on its side. Jesus loved this young ruler He said this hard thing to. The description of Jesus’s interaction with this man has the language of goodness—of a desire for the best for someone. But we clearly see that Jesus’s idea of the loving, best direction for this young man challenged the man’s own view of good. He left disappointed, unable to comprehend such an invitation from Jesus being worth the cost. Jesus’s invitation was not to self-actualization, but it was not to self-flagellation, either. We are not simply to deny ourselves or beat ourselves up. Those who lose their lives will find them, and the implication is that what they find is very much worth the pursuit (see Matthew 10:39). God’s good is the kind of sustaining, life-giving good that feeds our souls. Ultimately, God’s call to this young man, and to us, is about finding the best kind of good. It is about finding true life, not restricting it. Understanding the goodness of the God of the Bible (and the Bible itself) requires a long view through the dark room Jesus endured to the joy and goodness on the far side. In the end, God’s kingdom is fully realized and there is a new heaven and a new earth where we live in peace and joy with God as He first created us to do. This eternal good story must be the stream that feeds the reservoir that is our understanding of our earthly temporary good. As a practical note, I suggest Kathleen Nielsen’s study of Joshua as a great look at our faithful God who puts plans into place over hundreds of years that He beautifully brings to fruition. It’s a low stress study that leads readers right through Scripture, appropriate for individuals or groups.